For maximum endurance and sharpness, Panasonic arc 4 ES-LA63-S electric razor has 4 blades and these blades are 30-degree angle nanotech blades. It also has a dual motor shaving system. The dual motor is very powerful that provides hyper performance and it gives 14,000 cuts per minute. You will get 56,000 cross-cutting actions per minute through 4 blades. When the 2nd motor vibrates the shaver head of arc will be up and down to co-operate lift and hold hair and gives a clean, soft and perfect shave. The Panasonic Arc 4 ES-LA63-S electric razor’s head is able to cut all type of hair in the body and it can easily follow every contour of your face, neck and the sensitive areas also. The multi-fit ARC foils will enhance the shaving comfort. There is also a pop-up trimmer with the Panasonic shavers which is for sideburns and mustaches. It is a wet and dry shaver. So you can do a dry shave or a wet shave under the shower. It will take 3 minutes per shaves and you can do almost 14 shaves by a full charge. For a new user or someone who hasn’t used such a large shaver, this can make shaving a bit challenging. There is an ON/OFF button on the front of the shaver. The travel lock switch is situated in right below of this shaver. Sliding it up will physically obstruct the power button to be pressed. The shaver has 2 grooves where you can site your fingernail for slide it up and down otherwise it will be annoying to manage if your hands are wet. The LCD screen is more useful because it will show you necessary info, like time outdone since you started your shave, how much the battery has the charge if its need to clean the LCD screen will show cleaning reminder and it also shows a reminder when you have to replace the foils and blades. On the back side of this shaver, there is a pop-up trimmer and there is a multi-purpose slider in the right below with three positions. The 1st position, this shaving head moves freely and can help to sustain the foils in contact with the skin. 2nd position, in the 2nd position the head stay fixed and cannot move up and down or sideways. 3rd position, the slider will extend the trimmer, while you keeping the head locked into a fixed position. This shaping is also present with the Panasonic latest Arc3 and Panasonic Arc5 shavers. While I like the idea behind it, managing the slider realizes a bit shaking and the shaving head must be comparatively centered or you will not be capable to move the slider from the free to the lock position. For example, the ES-LF51-A uses a slider for extending the trimmer as well as a dedicated switch on the side to lock shaving head. Overall, the Panasonic ES-LA63-S is an excellent shaver and you won’t be disappointed with it. 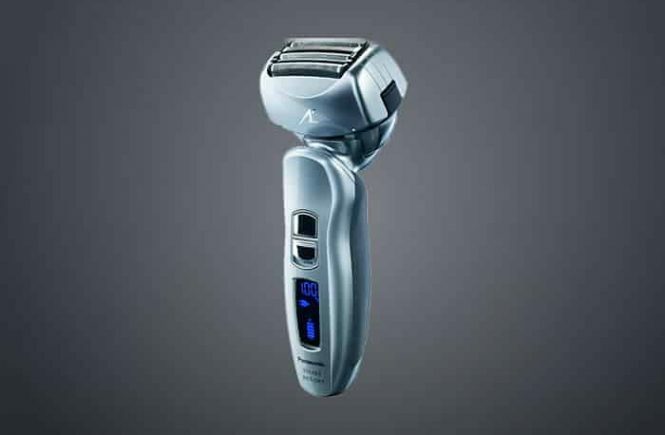 The Panasonic Arc4 ES-LA63-S is micro-thin; it will give you high performance and reduce your shaving time. 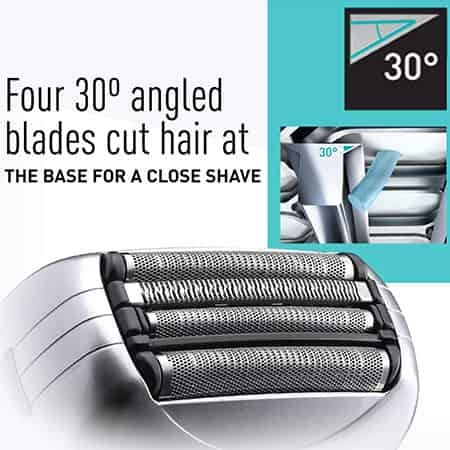 The super sharp stainless still blades can easily capture, lift and hold your mustache, 30-degree angle blades can cut hairs cleanly from the base and you will get a close shave. The shaver blades and foils are hypoallergenic. The swift men’s shaver usage a multi-flex active head, the head will ensure a soft and unique shave. The multi-flex pivoting shaving head can easily follow every contour of your body, faces like chin, jawline, neck, and head and cut the hair with super comfort. The pop-up trimmer is for mustache and sideburns and it will give you perfect finishing and detailing. You can do a dry shave or a wet refreshing shave with your favorite shaving gel, foam or soap with the premium Panasonic Arc4 ES-LA63-S electric razor. You can also use this shaver under the shower or shave over the sink. 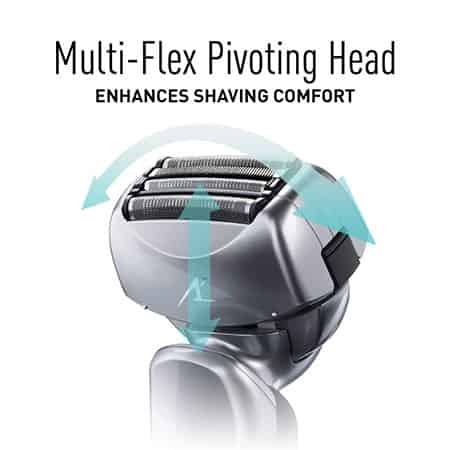 The shaving head of Panasonic Arc 4 ES-LA63-S shaving machine is gently curved and that is allowing the shaver to glide uniformly over the jawline along with the chine. 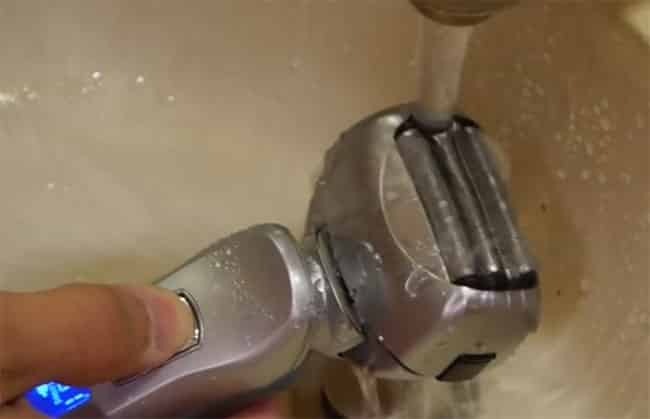 With the Panasonic Arc4, you can also move the shaver head in a circular motion and can do a rotary shaver. The Panasonic Arc 4 ES-LA63-S is a rechargeable shaver and the blades are forged and honed to an acute 30-degree cutting edge for cut more proficiently and neatly at the root. The stainless-steel, hypoallergenic blades, and foils give comfort on sensitive skin. The high-performance linear motor of Panasonic arc 4 ES-LA63-S will give you a smooth, clean shave within very short time. 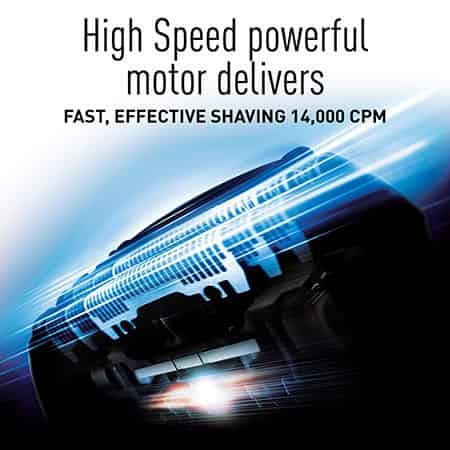 Panasonic designed the motor to shave at speeds of 14000 cycles per minute (CPM). Panasonic uses this linear motor for most of its Arc4(all of the Arc4). If you compare this shaver with 10000 (CPM) shavers, the Panasonic arc4 will finish its work almost 1.5 minutes faster. In a shaver, this unit is height powerful output. This characteristic is appointed to this model and to the ES-LA93-K Arc4, which is the same razor that also comes with an automatic cleaning station. The motor is settled inside the shaving head itself and this motor makes the foils vibrate and help to capture more hairs. When you use, you can really realize this vibrating motor at work, there is a notable but very sensible trickling sensation when you holding the foils against your face. The sound it (motor) creates is also different compared to the several Panasonic shavers that absence this feature. It has a lower pitch and by it, you can hear the spare hum created through the vibrations. Cleaning instructions, replacement parts leaflet. You can say, these are pretty basic but they should give at least a cleaning brush with this bundle or a lubricant bottle. The Panasonic Arc5 ES-LV65-S for an example comes with those instruments as well something more. The charging cord which comes with Arc4 ES-LA63-S is longer than other shavers, so this is surely a good thing. The plug is the USA or a European plug. The travel bag is the leather case. For example, Braun’s best shavers like Braun series 9, Braun Series 7 do not offer the same protection hard case and you will get it very reasonable price. I have used more razors from Panasonic than from any other brand and the making quality and construction were superb. In fact, currently Panasonic is one of the best manufacturers; Arc 4 is a combination of the latest Arc 3 and Arc 5. The Panasonic Arc 4 ES-LA63-S is an older model but it can easily compete with other shaver brands because in this price range for having the best quality shaver. I am meaning about Philips Norelco’s shaver 8900, Braun’s series 5 and Series 7. 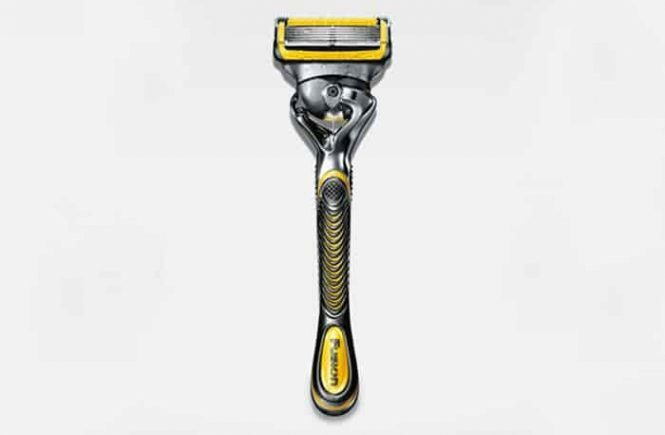 This Panasonic razor looks very likable and costly. The shaver is not usual navy blue or aqua color, the glossy silver color of this shaver gives a stylish look. The blue LCD screen indicator of this shaver, which gives you the feel of a high-quality razor. The body of this shaver is fully made out of plastic but it doesn’t feel inexpensive at all like the series 9 from Braun. Surprisingly, the glossy silver body of this shaver does a great job because it prevents against fingerprints and smudges. The making is very strong and oozes quality, especially the shaving head with its fascinating craftsmanship. Once again, I think Panasonic does better than any other famous brands. The shaver feels great in the hand for its lightweight. Although it is a large shaving unit, it is quite well balanced and it does not feel weighty at all. The handle girth of this shaver is dark grey rubber, which assures an excellent grip. The shaving head is relatively large than others and While the original surface is same on other Panasonic Arc4 shavers, the head of it seems unaccountably massive. I guess that the engineers needed more space to compromise the vibrating motor. All the Panasonic electric shavers are fit for a wet/dry shave and have to use them only cordless. The ES-LA63-S is established with a rechargeable Li-ion battery and that will provide you almost 45 minutes of work time. For being fully charged it will take only 50 minutes. The LCD screen will show you a reminder when battery charges in 10% increments. In the bottom part of the LCD display, there are also have 5 sections, every one corresponding to a 20% charge. The bottom section is only used for low battery signal. When you will turn on the razor it will take 5 seconds. After finishing your shave and turning the razor off, the LCD display will show you the duration of the shave as well as show you the battery percentage. The shaver is not for corded use. There is no cleaning station with this Panasonic razor but its updated model is Panasonic arc4 ES-LA93-K which comes with a cleaning station. It is very easy to clean a shaver by a cleaning station but there is no cleaning base with this model so you have to clean manually. The manually cleaning system is extremely easy and let’s see how to make a manual clean of this Panasonic shaver. You have to do expose and apart from the inner blades from the foil block, for thoroughly clean of the shaver use hot water and a bit of detergent liquid soap. 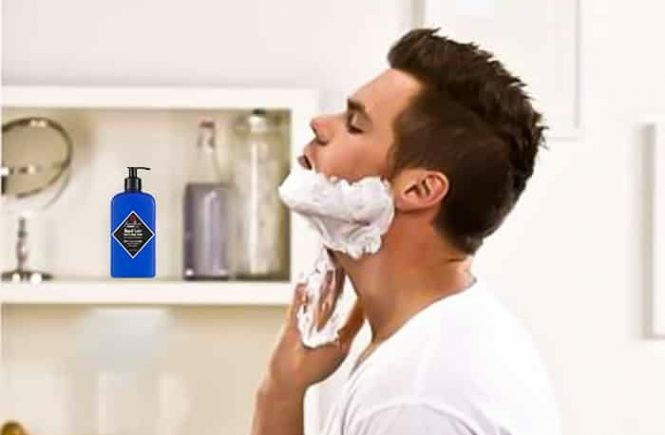 If you do a dry shave, you have to use soap once or twice every week and just clean your shaver with hot running water. But if you do a wet shave with shaving gel or cream, then a thorough cleaning you must have to use soap after each use. After finishing your shave, you have to press the 2 tabs to release the foil frame. Tap the bottom of it mildly on your sink to discharging the hairs which are clippings trapped inside. For a quick clean you have to apart the shaving blades and the foils then just wash them under the hot running water and let them air dry under the fan. Snap the foil frame back to the shaver then you have to pour a bit of water on the shaver and place 2 or 3 drops of liquid soap on the foils. Press the ON/OFF button for activating the sonic mode, at least 2 seconds. You will observe the blades will start to palpitate so fast. The sonic cleaning mode gives you a signal through the LCD panel. After 20 sec the shaver automatically will turn off, you can also turn it off sooner by pressing the power button. Remove the foil frame then wash it by hot running water, again press the ON/OFF button for 2 sec and active the sonic mode. Fully wash the inner blades with hot running water. Then, shake off reducing extra water from it, dry all the parts with a napkin and let them air dry completely before joining all the shaver parts. There are some models of Panasonic arc 4 which did not come with a lubricant like ES-LA63-S, it is very important to do a thorough clean after every use to prolong the foil’s life and blades. If you will apply a light lubricant on each foil after every washing that implicit the use of soap and the foils will be strong. The Panasonic ES-LA63-S made with inner blades combo and the foils (WES9025PC). You can buy it directly from Panasonic’s website. You should replace them when you will feel the performance and shaving comfort is not like before. It will depend on your shaving habits, this can need sooner than 12 months or later than 12 months which recommended by the manufacturer. Replacement of Panasonic foils and blades are always costly. You have to spend almost the same money which is the need for the replacement parts of Braun series 7 or Braun Series 9.
Who Should Buy The Panasonic ES-LA63-S Arc4??? This review about Panasonic arc 4 ES-LA63-S is mostly positive. There are a few glitches in this product otherwise it is a great product. It will give you very close, fast and comfortable shave and give you similar performance like other expensive razors, whose price is more than Panasonic ES-LA63-S. So if you want to buy a new shaver or an upgrade to your presence on, must consider the LA-ES63-A. 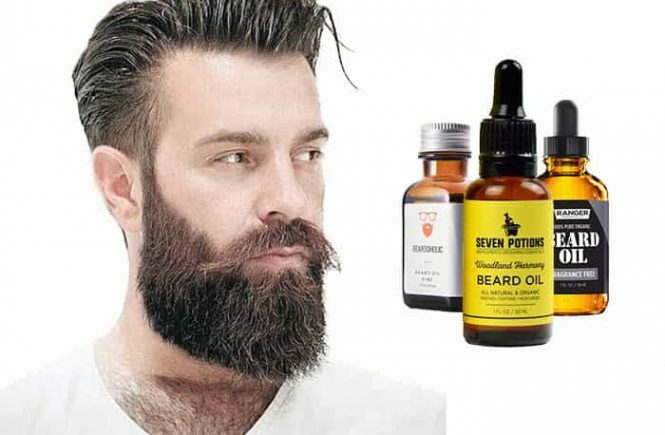 You can do a dry shave or wet shave with shaving gel, foam or cream through it and you can also cut your head hairs successfully. But if you have very sensitive skin or suffer from ingrown hairs, shave bumps or other serious skin diseases, Braun series 9 or 7 will be better for you. This shaver also has wet/dry system. You will get a charging dock and a cleaning station with this model. 2 years warranty. With this shaver, you won’t get a lot of instruments but it is a very durable product. The cleaning station of this model is a vortex hydra system. It does not look so stylish but it works very well and the cartridges are not expensive. It is also a wet and dry shaver and there is no cleaning base with it. The 4 blades can cut 30-degree angle. It also has a pop-up trimmer. Stainless steel multi-fit arc4 foil gives you close and comfortable shave. The shaving head is flexible and it can easily follow every contour of the face. It is 100% waterproof so you can use it under the shower and also use shaving gel, foam cream in your shaving time. Since there is no cleaning base so you have to do manual clean and it is very easy like Panasonic ES-LA63-S.
With this model you will get a cleaning station, AC adapter, cleaning cartridges, cleaning brush. It is 100% washable and you can use it under the shower and in your shaving time, you can use shaving gel, foam or cream. You can use it corded and also cordless. I think you will be satisfied with this product.